Crisis on Earth-Blog: The DC Challenge! You see, this is what happens when you put the personal freedoms of radicals and fringe elements ahead of the rule of law and order and keeping people safe. Without constant, non-stop dedication to justice, you cannot succeed. Plus it helps to carry a big mace. Sorry, but you are going to have to work a little bit harder to solve the DC Challenge! Is there any Hawk-related stuff at your local comic book shop this week? Le'ts find out! Final Crisis #7 -- The Hawks showed up together in the previous issue, in what actually was one of the most poignant and moving little scenes that Morrison has created thus far for the series. Now, admittedly I am biased, but in those two panels I think Morrison said a lot about both Hawkman and Hawkgirl and their relationship. Looking forward to this one in general as well as how the Hawks fit into things. Justice Society of America #23 -- With the threat of Gog taken care of, it's time to see the JSA move back together after the divisions which began to form. I imagine Hawkman will have to be crucial to that. Trinity #35 -- As usual, Hawkman makes regular appearances in this title as part of the backup feature. Well folks, I am in beautiful (as well as freezing cold!) Minneapolis, MN for business this week, so updates will be spotty at best. Things should return to (relative) normalcy next week. Title: "The Origin Of The Golden Age Hawkman"
Summary: In the late 1930s, Carter Hall receives a strange crystal knife from an acheologist friend and immediately has a flashback to ancient Egypt. There, he is Prince Khufu, battling against the devious priest of Anubis Hath-Set. Khufu is able to avoid being sacrificed by the priest and goes to the side of his lover Princess Shiera. He is followed by Hath-Set's loyal soldiers, and despite putting up a valiant struggle, the two lovers are captured. Hath-Set brags about his accomplishment as he murders Khufu and Shiera, but Khufu declares that he will get back at the priest. Carter awakes back in his time, and immediately discovers strange electrical disturbances in the subway, which has killed several passengers. In the panic he finds Shiera Sanders, a dead-ringer for Princess Shiera from his dream. Carter takes her back to his place to recover, then dons a costume of his own design -- including an anti-gravity belt made of a strange "ninth metal" he recently "invented." Arming himself with a quarterstaff, Carter -- now as Hawkman -- seeks out Dr. Anton Hastor, electronics expert and reincarnation of Hath-Set. Hawkman wrecks his lab, but Hastor manages to escape. While Hawkman heads back to check on Shiera, he discovers her and the crystal dagger both gone. 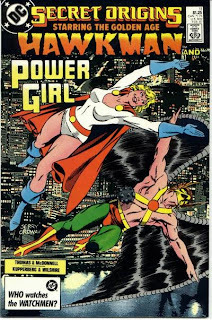 Trailing her to Hastor's place again, Hawkman saves Shiera from being electrocuted. While struggling with Hastor, Hawkman knocks the evil doctor into his dynamo, frying him. 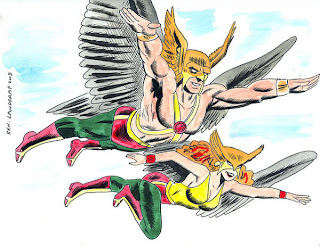 Hawkman takes Shiera home, and a new bond is formed. Review: Sound familiar? 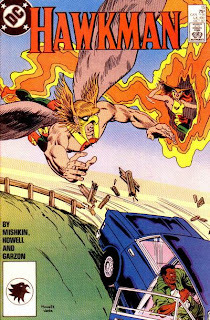 It should, since this is a pretty straight-forward retelling of Hawkman's origin from Flash Comics #1. But then again, this is Roy Thomas handling the writing here, so you really don't expect anything different. Which is not a problem, because this is a very nicely constructed retelling of Carter Hall's origin and genesis. Luke McDonald's pencils have a nice weight to them, and there is a nice division between the panels set in the "modern" day and those set in ancient times. Nothing groundbreaking but fun reading (at least the Hawkman story; I made it about 6 pages into the Power Girl story before I gave up). Image: Secret Origins #11, 1987, Jerry Ordway. Our sketch this week is by Ken Landgraf. In addition to doing animation and storyboard work, Ken has done Hawkman and Hawkgirl in World's Finest for DC, as well as some Unexpected, Superman, and Nightwing and Flamebird stuff. For Marvel, Ken worked on some Hulk and Wolverine features. You can check out his website at Kendlandgraf.com. I really like classic, simple lines of this piece. The colors are really nice, but I think this would have looked just as good with only the pencils. Although, without the color, we wouldn't have Shiera's awesome red hair, which I am sure will please certain readers of this blog. 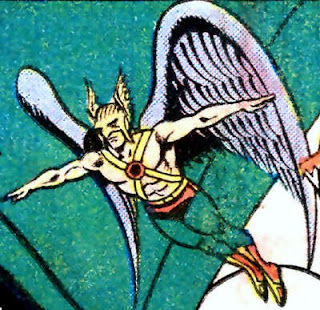 The oversized Honor Wings on Hawkman's helmet is an interesting take. I'm not sure how that would work in a series of panels, but I like it in this sketch. Image: Hawkman sketch, 2008, Ken Landgraff, retrieved from Comic Sketch Gallery. 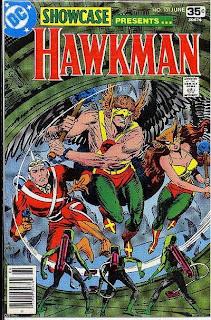 Summary: In the Himalayas, Hawkman, Hawkgirl, Speed Saunders, Jayita Sahir and Danny Evans are the prisoners of Helene Astor and her devoted, Darkraven. Helene informs her captors that she is, of course, the reincarnation of Hath-Set, and that Darkraven is the reincarnation of her lover, just like the Hawks. She plans to use a strange alien device to permanantly kill the Hawks' souls and end the reincarnation cycle. Hawkman immediately recognizes the device as a Thanagarian Absorbascon! Having heard enough, Hawkman stops the planned execution by letting slip his secret ally: The Atom! The Tiny Titan was hanging around the whole time, but they had to wait until the plan was revealed to make their move. Atom frees the Hawks and the other prisoners, and a big battle ensues, with Hawkgirl going directly after Helene. In the fracas, the Absorbascon is hit by an errant shot and apparently damaged. Trying to grab her alien device, Helene is turned to solid stone the moment she touches it! Horrified, Darkraven rushes to his love's side, but as soon as he touches her, he too undergoes a change -- into a seven foot tall humanoid raven! Review: This issue is mostly a catch-up/fill-in type, as we learn a little bit about Helene Astor and get some Thanagarian technology thrown in for good mix. Atom popping up at the end reminded me of the early parts of the first volume of Heroes for Hire, where Ant-Man was with the team on every mission, but no one was aware of it. I'm not sure why the Absorbascon did the things it does in this issue, but hey, it's an Absorbason... it can do anything! Darkraven's transformation results in something which would not look out of place in a sentai episode -- I like sentai, but not everyone does, obviously. There is a pretty big jump from the cliffhanger last time (dying in the snow) to now, which is okay except that Hawkgirl's injury seems to have healed pretty quickly. Gotta love that Nth metal! An alright issue, but clearly expositionary and setting up the big blowoff. Image: Hawkman v.4:no.11, 2003, John Watson. What can you expect to see in your local comic book shop featuring the Winged Wonder this week? Let's take a look! Justice League of America: The Lightning Saga -- Hawkman appears in this collection thanks to the crossover with Justice Society of America. Hawkgirl features as well. I never read the JLoA segments of this crossover so I don't know how the overall story works, but the first JSoA issue was quite good, while the second (featuring an extended fight with Computo) was really, really bad. But that's just me. Apparently it is better if you know your LOSH stuff, which I do not. Trinity #34 -- I feel like I say this every week, but it bears repeating: Hawkman has been a frequent guest star in this series so there is a good chance of him popping up here. This image was passed to me by comics blogger extraordinaire Rick Phillips, who runs Mail It To Team-Up, Let's Rap With Cap, Comic Book Letterheads, and Plastic Man Platitudes, among other sites. Needless to say, this bearer of the Honor Wings keeps busy, and this is no exception. 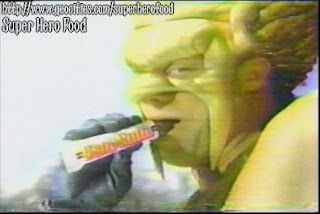 I have never seen the commercial in question, but the idea of Hawkman eating a Baby Ruth candy bar seems a little silly to me. Clearly he'd like something more bird-related, like Chik-O-Stik. Or, if we're going on that route, a Zagnut, I suppose. Do you have something neat or unusual which is Hawk-related? Send it in and you too can earn your Honor Wings! Image: Baby Ruth commercial screen capture, ?? ?, retrieved from unknown. Batman: The Brave And The Bold S.1:Ep.7: "Dawn Of The Dead Man!" 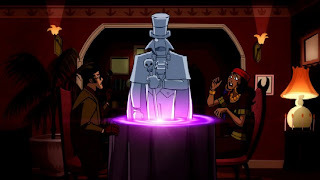 Last week on Batman: The Brave And The Bold, we once again got an appearance by that most spectral foe of Hawkman, the Gentleman Ghost! Unlike his first appearance, this time the Ghost was the main villian of the episode, hanging out in London and trying to raise an army of undead criminals to become his army. Lucky for us, Batman, Deadman, Green Arrow and Speedy are on the case. Gentleman Ghost really looks sharp in animated form. His voice, supplied by Greg Ellis, hits the right note of sophistication mixed with anger for the former highwayman turned ghostly bad guy. Further fun is derived from the character's vulnerability to Nth Metal, once more on display in this episode, as both Batman and Green Arrow are well stocked with the strange metal in their gizmos. Will we eventually see Hawkman on the show? We can only hope! 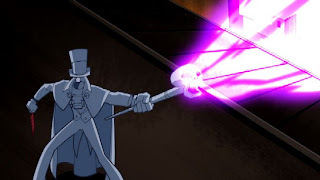 Image: Screen captures of Batman: The Brave And The Bold, episode "Dawn Of The Dead Man!" retrieved from Comic Book Resources. This sketch is by David Michael Beck, a veteran illustrator who's career has spanned all sorts of markets and all sorts of work, from comic books to advertising, to institutional work, to graphic design. According to the bio on his website, he has worked for Marvel, DC, Top Cow, and Dark Horse (in the comic book world), on titles as varied as Red Sonya, GI Joe, and Buckaroo Banzai. I am not really familiar with Beck's work but this Hawkman looks very dynamic. I like the lithe form of the body, which retains it's power despite the ease with which it seems to move. The wing harness seems a little too small, but the feather work is nicely detailed. I do like the details, like the ornate studs on the shield, and the way the strap for the morningstar pulls against his wrist. All in all a nice piece, with good strength and fluidity. 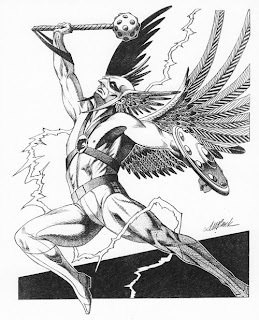 Image: Hawkman sketch, ?? ?, David Michael Beck, retrieved from Catskill Comics. What kind of Hawkman stuff is coming out at your LCS this week? Let's take a look. Ame-Comi Hawkgirl PVC Figure -- I'm not much of an anime fan (I can count the number of anime shows I like on one hand), and these statutes don't really appeal to me. But this one of Hawkgirl actually looks pretty neat in an Elseworlds, Multiverse sort of way. Final Crisis #6 -- Hawkman popped up last time, so I guess he is back on Earth just in time to see Darkseid utterly subjugate it. This series has kept me guessing from the start and I am very eager to see it continue. Trinity #33 -- The Winged Wonder has been a regular in the backup story for this title, and has a good chance of popping up again this week. I thought this was appropriate, considering yesterday's post. This house ad for Showcase #101 may ask a lot of questions, but it also catches the eye with no fewer than three Hawkman logos as well as a miniaturized version of the dynamic Kubert cover. The copy of the questions -- asking basic questions which readers of Hawkman's adventures from the 60s would easily know -- really pushes the "revival" button I talked about previously, that this was DC's big push to get Hawkman back into their reader's collective consciousness as a hero outside of the JLA. 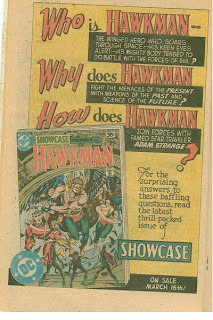 I especially like the "Why" question, which restates the classic Hawkman introductory text. I don't know how effective this particular instance of this house ad was, though... since I scanned it from inside my copy of Showcase #101. "Hey kids, check out this cool comic book... which you already bought!" Ah well, it's an A for Effort if nothing else. Image: Showcase #101 House Ad, 1978, Joe Kubert (cover art), scanned from personal collection. Summary: Hawkman, in his spaceship in Earth orbit with Hawkgirl, recieves a distress call from his old ally Adam Strange, who is coming in for a hot landing! Adam is being persued by one of the many alien races which have begun a war against Rann. The Hawks get Adam aboard and manage to warp away from the hostiles, despite the damage the ship suffers in the attack. Adam recaps the recent events: Rann was attacked out of nowhere by a consortium of foes, driving himself (along with his wife Alanna) underground as part of a resistance force. He was trying to reach the Justice League but was followed and attacked. Adam fears that his family has been captured, but Hawkgirl assures them that the Justice League will help. Unfortunately, Hawkman reports that the controls have been damaged, and they are locked on course for Rann. Secretly, Hawkman suspects sabotage, but is unsure why Adam Strange would do something like that. He goes EVA to try to change course manually, but the ship is attacked once more by a different hostile race. The Winged Wonder is just able to get back inside before they warp out again. Hawkman confronts Adam about the sabotage, but as they argue, he figures it out -- and discovers none other than the Shadow-Thief stowing away on the ship! The Thief was a volunteer for a government space shot, and once in orbit a mysterious voice instructed him on how to build a new Dimensiometer and how to sneak aboard the Hawks' ship. The trio attack Shadow-Thief, but are unsuccessful until Hawkman uses the ship's computer to transport himself into the Shadow dimension and knock the Thief out. The saboteur defeated for now, the ship comes out of warp into orbit around Rann, and the occupants are shocked to discover that the planet which has begun this space war against Rann is... Thanagar! Review: Wow! 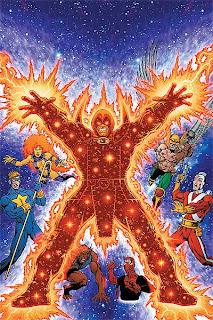 Since his eponymous series was cancelled (that is, The Atom & Hawkman) some nine years prior, the Hawks had been limited to appearing in Justice League of America, with the occassional guest spot or backup. So this high-flying space opera style adventure was definitely a shot in the arm for the character, a new status quo and a new attempt at a revival. Of course, the "revival" was pretty slow going, with the result of this story being another string of backups (in World's Finest), but it eventually did lead to the Shadow War and all that. it was clear that DC wanted to refamiliarize readers with the Hawks and Adam Strange, as they each get a page to catch new readers up on their history. Taken on it's own merit, this is a solid late 70's DC comic, with lots of action, some great alien and technology designs, a Shadow-Thief apperance and a heck of a cliffhanger. Milgrom's art is strong, and he seems to enjoy handling the trippier elements such as the space warps and the bizarre aliens. Scribe Jack Harris has a good grasp on the characters and his pacing is really nice. The EVA sequence, which counts down how long Hawkman can last in the vacuum, is a standout. Joe Kubert handles the cover, and it's a great character piece. I can really imagine this image standing out amongst the crowd on the newsstand. Even the title is a nice touch. I only have this issue so far, but now #102 and 103 are on my "must find" list. Image: Showcase #101, 1978, Joe Kubert. This piece is done by Ed McGuiness with inks by Dexter Vines, and was stumbled upon by your struly at the Comic Geek Speak Sketch Gallery. (Note: I want to stress that I do not have possession or any ownership of this image, and am merely reposting it from another site!) The hulking, dangerous looking Hawkman is certainly along the lines of what we have come to expect from the character following the revamp/resurrection in the pages of JSA. I am not sure what to think about the club (because, let's face it, that's not a mace), but I really like the look of the helmet, and the completely hidden face beneath it. I'm considering making this a regular feature here on the blog. Would anyone out there be interested in seeing more sketches of the Winged Wonder? 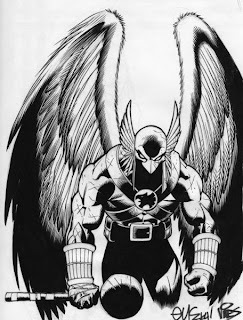 Image: Hawkman sketch, date unknown, Ed McGuiness & Dexter Vines, Retrieved from Comic Geek Speak Sketch Gallery. I picked this little beauty up yesterday at my LCS, Borderlands, while killing an hour waiting to pick my wife up from work. It's from the latter portion of Hawkman's short-lived second volume, which lasted on 17 issues. 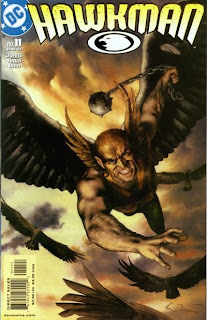 This series spun out of Tony Isabella's Shadow War Of Hawkman miniseries and initially followed up on the themes Isabella established, but this point he was off the title and evidently the writing was on the wall. Still, Richard Howell's pencils look nice, evoking that psuedo mid-80s DC "house style" I like to ponder sometimes. This series is hard to find in discount bins, so I think this year at HeroesCon I will have to spend a little more and hunt it down a little more. Image: Hawkman v.2:no.15, 1987, Richard Howell. Well, we're past the holidays and back on a more normal schedule for our comic book goodies. So where can we find the Winged Wonder this week? Let's take a look. Justice v.3 TPB -- At some point I will pick up this series, with Alex Ross's sorta-Superfriendsed Justice League of America battling the Legion of Doom. It seems that at some point there will be a big Absolute or what have you. The series seems like the kind to warrant that kind of treatment from DC. Trinity #32 -- Hawkman has been a regular in the title, and seems to be playing a large role lately. Still waiting to see how DC is handling the trades for this title, because the backup material in Trinity is clearly a different animal than the stuff in 52 or Countdown. Maybe 4 collections of the "main" story and 2 to collect the backups? We'll see, I suppose. No sooner does Graphitti offer a Hawkman logo t-shirt in Previews then I come across a second piece of apparel. 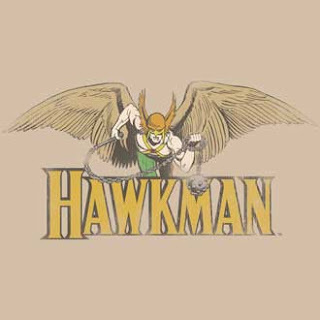 This shirt, part of the DC Originals collection from Pop Funk, offers a nice nuetral color as a background for the classic Hawkman logo as well as the Winged Wonder himself. The sand color I think is a good fit for the character, and even the slight distress fits a hero who has been around as long as Hawkman has -- both in the real world as well as in the DC Universe. Pop Funk has lots of other great shirts for you DC fans, including such rarely seen (on t-shirts, anyway) characters as Green Arrow, Red Tornado, and the Martian Manhunter. Pretty cool stuff! Image: DC originals Hawkman t-shirt detail, retrieved from Pop Funk. Well, thanks to a tip from reader Chris, I decided to go ahead and purchase the singles I could pick up from Rann Thanagar Holy War, rather than wait for the trade. I already have the two Specials, plus with my LCS's discount this is the cheaper route. Of course, as you can see I only was able to get the last four issues, meaning that until I can find the earlier ones (or, more likely, order them from an online service), I won't be able to read the story. D'oh! Such is the trials and tribulations of comic book fandom! Image: Rann Thanagar Holy War #5, 2008, Jim Starlin.